How do I connect and disconnect my Razer Edge or Razer Edge Pro into the Gamepad Controller? Unlock the tablet latches at the bottom of the Gamepad Controller and ensure that the clasp is fully released. Carefully start inserting the Razer Edge diagonally towards the top of the Gamepad Controller, and press down on the Razer Edge. Once the Edge is flush in the Gamepad Controller, push the clasp at the bottom to secure the unit. To disconnect, unlock the tablet latches, ensure that the clasp is fully released, and carefully lift the bottom part of your Razer Edge to slide out the unit. If you were unable to troubleshoot and resolve any issues you are having with the knowledgebase (FAQ), please do not hesitate to contact us here or call 1-855-872-5233. Does the Razer Edge Gamepad Controller come with the Extended Battery? 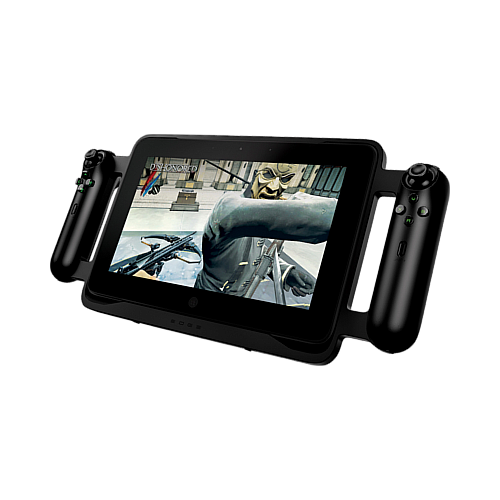 The Razer Edge Extended Battery is sold separately from the Razer Edge Gamepad Controller and is not included with the Gamepad Controller. For a full list of accessories for the Razer Edge and Razer Edge Pro as well as other Razer products, please click here. What is the correct way to insert the Extended Battery for the Razer Edge Gamepad Controller? To insert your Extended Battery into the Gamepad Controller, insert the side with the three tabs diagonally into their respective slots in the top of the housing for the Extended Battery inside of the Gamepad Controller. Once this side of the Extended battery has been inserted, press the bottom half of the battery into the housing to secure the battery into its locked position. How do I remove the Extended Battery or Extended Batter Placeholder on the Razer Edge Gamepad Controller? Move the quick release latches under the Extended Battery or Placeholder to their outward position. The Extended Battery or Placeholder should release from the bottom and can then be removed. Where can I find the Serial Number for my Razer Edge Gamepad Controller? To find the Serial Number for your Razer Edge Gamepad Controller you will need to remove the Extended battery or Extended Battery Placeholder that the Gamepad Controller comes with. To do this please move the quick release latches under Extended Battery or Placeholder to their outward position. The Extended Battery or Placeholder should release from the bottom and can then be removed. Once removed, you should find a sticker listing the serial number as well as the model number for your Gamepad Controller. When and where can I purchase the Gamepad controller? The Gamepad Controller requires minimum maintenance to keep it in optimum condition. It is recommended that you unplug the device and clean it once a month using a soft cloth or cotton swab with a bit of warm to prevent dirt build-up. Do not use soap or harsh cleaning agents. Is there any kind of maintenance I need to perform on my Gamepad Controller to keep it working correctly? Is the Gamepad Controller supported on Razer Synapse 2.0? At this time the Gamepad Controller is not a Razer Synapse 2.0 compatible device. Key binds and button mapping can be done via the options menu within the different games and programs.